Formal evening wear, designer names and sparkling jewellery were in abundance yesterday evening as a line of Mercedes cars queued outside the Shelbourne Hotel in Dublin city centre. A few members of the public waited patiently in the rain to catch a glimpse of the celebrity wives as paparazzi camera flashes lit up their faces. Andrea Corr was one of the first to arrive, followed quickly by Amy Huberman, and then eight-time winner Ali Hewson. Entertainment was provided by Daniel O’Donnell, but it was for the award ceremony that everyone had come. Paddy Power bookmakers had Ali as a clear favourite to win again this year. Then sometime this summer Jenny Bloggs came to the attention of the judges. 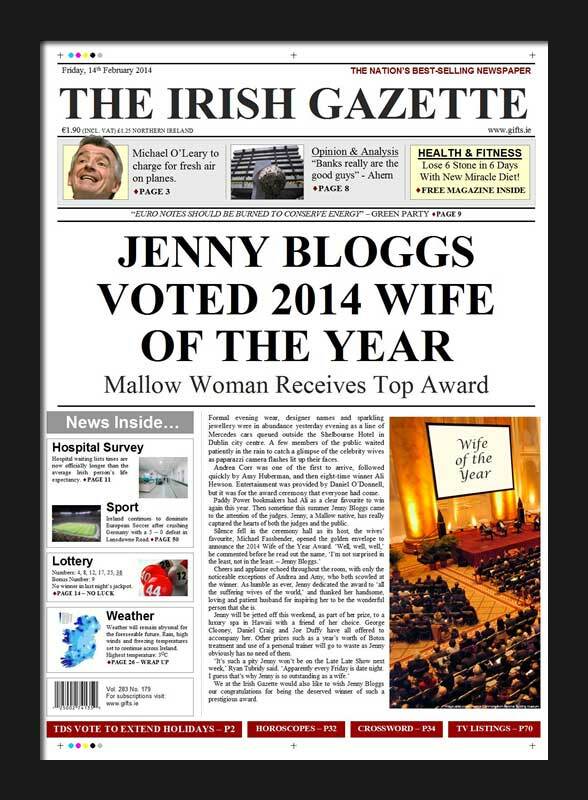 Jenny, a Mallow native, has really captured the hearts of both the judges and the public. Cheers and applause echoed throughout the room, with only the noticeable exceptions of Andrea and Amy, who both scowled at the winner. As humble as ever, Jenny dedicated the award to ‘all the suffering wives of the world,’ and thanked her handsome, loving and patient husband for inspiring her to be the wonderful person that she is.